Dogs love to eat things and they love to chew on things. So, if you don’t give them something to chew on, they will eat the things that you don’t want them to. We’ve reviewed the best dog chew toys in a previous post, but if you’re looking for a consumable treat that will also satisfy your pup’s insatiable need to chew, pig ears offer a natural and flavorful treat for dogs that also improves their health when used properly. Anyone that has a dog should consider giving their dog pig ears to snack on. We reviewed dozens of pig ears to identify the best of the best. To find the best pig ears for dogs, we compared their ingredients, cooking methods, size, thickness, flavor, containers, pack sizes, and more. That way, we can show you why some pig ears stand out from the rest. Give your dog the best treat with the Brutus & Barnaby 100% Natural Whole Pig Ear Dog Treat. Our top pick, the Brutus & Barnaby 100% Natural Whole Pig Ear Dog Treat, offers the best combination of all of the factors that we looked into. The combination of flavor and healthy ingredients makes these the best for your dog. Plus, you can get them in large packs too so that you can stock up on treats that work well for snacking or for training. Either way, they are a healthy alternative that your dog will enjoy. The Brutus & Barnaby 100% Natural Whole Pig Ear Dog Treat is out top pig ear pick. With the Brutus & Barnaby 100% Natural Whole Pig Ear Dog Treat, your dog gets a combination of soft cartilage and pigskin. The cartilage gives them a more elastic texture while the skin is smoked to be harder and crunchier. The result is a combination of chewiness and crunchiness that dogs enjoy. These treats come in a pack of 25, although larger and small packages are available. That way, you can get as many as you need to keep your dog happy. The ears themselves are large making them the right size for any dog. They come in a resealable container too so that you can keep them for as long as you need to. One of the best features of the Brutus & Barnaby 100% Natural Whole Pig Ear Dog Treat is that they are 100% natural pig ingredients. They are prepared without additives or preservatives, which makes them a healthier option than many other types of dog treats. Plus, chewing them regularly can help improve your dog’s teeth. Healthy teeth are crucial for a dog’s long and happy life. Try the thicker option with USA Pig Ears by Best Bully Sticks, a thick-cut, all-natural dog treat. The USA Pig Ears by Best Bully Sticks – Thick-Cut, All Natural Dog Treats is our runner up pick for pig ears. These ears offer many of the same benefits as our top pick with one noticeable difference: a thicker cut. These ears are cut thicker than standard pig ears, which offers variety and makes them better for larger dog breeds. Larger dogs often tear through thinner pig ears quickly and they offer little enjoyment beyond the taste. However, USA Pig Ears by Best Bully Sticks take more effort to chew without being difficult. That way, your larger dog can take the time to enjoy each ear. Despite the thicker cut, many of the benefits remain the same. They are made with all-natural ingredients, which make them a healthy snack option for any dog breed. The cooking process gives them a natural pork flavor as well. Each ear is inspected for quality and presentation. That way, you can be sure that each ear your dog eats provides the same level of quality and enjoyment without risks from contaminants and chemicals. To get the most out of the USA Pig Ears by Best Bully Sticks, you can get them in two pack sizes. There is a smaller eight-pack, which is a good option for smaller dogs, or dogs that only snack occasionally. For bigger or multiple dogs, you can take advantage of the 20-pack so you can stock up for when you need them. Save money on pig ears your dog will go crazy for with the Pet Qwerks Pig Ear with Real Bacon. The Pet Qwerks Pig Ear with Real Bacon is our best budget pick for pig ears. It is different than the other pig ears on this list since it is engineered rather than an all-natural product. It combines the real taste of pork with a nylon-infused structure. The pork flavor is what keeps your dog interested while the nylon-infused body makes it highly durable. This chew toy is FDA approved and uses approved nylon and real bacon. Your dog can spend hours chewing on this toy to enjoy the flavor and get many of the benefits of a pig ear. Plus, it is a great alternative to other pig ears since it can outlast them all. The biggest benefit from the Pet Qwerks Pig Ear with Real Bacon is its cost savings. At just $12, it has an above average price for this list for a single pig ear. However, it is reusable and the most durable pig ear on this list. With the ability to last more than the amount of time it would take your dog to go through an entire bulk pack of ears, a single one of these ears is more affordable than any other pig ear on this list. Get enough pig ears to keep several dogs busy for months with the Pig Ears for Dogs 100 Pack. The Pig Ears for Dogs 100 Pack is our best bulk package of pig ears pick. Buying pig ears in bulk can be an effective way to save money, especially if you have multiple dogs. While it may seem like a bigger investment upfront, buying these ears in bulk lowers the cost of each piece, and makes it easier to save on costs like shipping and individual packages. That way, you can stock up for a while since it would even take a pack of dogs more than a month to go through 100 pig ears. These pig ears are made in the U.S. using USDA and FDA food preparation guidelines. In fact, these ears are produced in an FDA facility under strict controls and guidelines to produce a healthy and clean product. The cooking process involves backing and does not include antibiotics, steroids, or hormones. Without additives, these ears are a healthy alternative for your dog to snack on. The biggest benefit from the Pig Ears for Dogs 100 Pack is the number of ears that you get. These are large pig ears, which will take longer for dogs to finish off. However, 100 of these ears could last you several months depending on the number of dogs that you have. Assuming that your dog ate one of these ears every day, one box of ears would last you for more than one-fourth of the year. When you add up the cost of one year worth of individual ears, you’ll save money by ordering these bulk packs. Offer your dog a thick, delicious snack with these Brutus & Barnaby Pig Ear Slivers. The Brutus & Barnaby Pig Ear Slivers is our top pick for those looking for a thicker-cut option. When you need a good snack or training tool for your dog, Brutus & Barnaby’s Pig Ear Slivers make a great choice. That is because they offer the benefits of a full pig ear like robust pork flavor and the enjoyment of chewing but in a smaller and more manageable size. You can use them as small add-on snacks for bigger meals, as well as training treats for larger dogs. The biggest benefit that you get from the Brutus & Barnaby Pig Ear Slivers is their thickness. Although they are slivers, they are cut thicker than most other pig ears. This gives them more durability and helps to pack extra flavor into a smaller package. That way, your dog can enjoy them for a bit longer and work a bit harder to chew them. Another feature that makes these treats stand out is that they are measured by weight rather than by counting. The packages come in 1-pound or two 2-pounds letting you choose how much you need for your dog. That means that you get a lot of pieces in each bag since pig ears are generally low in weight regardless of their size. Anyone who has dogs should consider buying pig ears. Dogs love to chew on things. If you don’t give your dog something to chew on, then your pup is bound to find something lying around the house to satisfy his need to gnaw – like your favorite slippers, or perhaps even your couch. Pig ears are a tasty way of incentivizing your dog to leave your stuff alone. Pig ears also have health benefits for your dog. For dogs, healthy teeth are essential for overall health. Pig ears help clean dogs’ teeth and strengthen their gums. As a result, your dog will have healthier teeth into her later years. Ingredients. The materials used in the production of pig ears including, of course, the ear itself, as well as any added flavors. They shouldn’t contain any bone which can splinter or crumble. FDA and USDA approval. Approval by the FDA or USDA as a food item that is safe to eat. Cut. The thickness of each pig ear, which can come in a standard or thick cut. Full vs Strips. The size of the ear based on if it is whole or cut into strips. Size. The overall size of the ear measured in small to large. Pack size. How many pig ears come in one pack. Are pig ears healthy for dogs? Pig ears have health benefits for dogs if used properly. Dogs’ teeth benefit from the chewing as it strengthens their gums and cleans their teeth. While pig ears can offer nutritional value as well, they cannot replace entire meals. Likewise, they should be limited to a few per dog per day, while most owners limit their dogs to one ear per day to ensure that they are getting enough else to eat. They are best used as snacks or meal supplements. What are pig ear dog treats made out of? Pig ears are made out of pig ears that have been cooked. Most ears come whole and are baked or smoked to preserve them and prepare them. The cooking process dries them out so that they last in storage and have a chewy or crunchy texture. While it is possible for pig ears to use other ingredients, most use the pig ear itself as their only ingredient. The industry as a whole avoids additives, chemicals, and, to a lesser extent, hormones. Why do dogs like pig ears? Dogs like pig ears for several reasons. The most important reason is that they taste a lot like bacon, as close to bacon as dogs can safely get. They are baked or smoked to bring out the rich port taste that dogs love. Pig ears are also a dog’s favorite treat because they are edible. Dogs love to eat things that they chew on. Also, dogs love to chew on things. Pig ears cannot be eating in one big. It takes even the biggest dog effort to chew up a pig ear completely. So, dogs like to spend time with pig ears since chewing them yields multiple forms of enjoyment. Can I give my puppy pig ears? Yes, your puppy can have pig ears. However, it is important to be aware of the potential risks of doing so. Puppies have weaker teeth than older dogs and cannot chew larger pieces effectively. So, you will want to give your puppy pig ear slivers or standard-cut pig ears of a smaller size to start with. Also, do not leave your dog unattended with a pig ear until you are sure that your dog can handle it. Puppies tend to bite off pieces that are too big to swallow, which can be a choking hazard. We looked at 20 other pig ears for dogs. Even though they didn’t make our 5 best pig ears list, they’re the best of the rest and each is still a great option for your dog. The information you’ll need to compare each one is included with the listing. This Best Pet Supplies Pig Ears bulk pack is a great way to stock up on pig ears for your dog. It includes 100 pieces that are FDA and USDA approved. That way, they help keep your dog healthy by avoiding many of the lower-quality ingredients that can make dogs less healthy. Plus, these pig ears help clean your dog’s teeth as he or she chews. Healthy teeth are the key to a dog’s long and happy life. If your dog doesn’t go through pig ears that fast, then check out this bulk pack of Cadet 00960 Gourmet Pig Ear Dog Treats. There are 100 pieces in the pack and each one is individually shrink-wrapped. That way, they will stay fresh longer and you only need to open one at a time. They are medium-large ears so your dog will enjoy each one for a long time. WIth the Jones Natural Chews # 118 8 oz Pig Ear Dog Treat / Snacks bulk pack, you get 12 8oz snack packs of pig ear strips. The strips are a better option for giving your dogs snacks or training dogs. The strips are big enough to be a snack for any size dog. They are made in the U.S. with all natural ingredients so that they are a healthy snack for your dog. These Pig Ear Half Chews are made out of all natural ingredients in the U.S. each snack is half of a large pig ear. You get 25 packs in the bulk pack, so there is plenty for your dog to enjoy for a long time. They are made with natural ingredients, and chemicals or preservatives are not used at all for a healthier dog snack. If you are looking for a healthier pig ear snack for your dog, check out these Punk Hollow Premium Smoked Pig Ears for Dogs Made in the U.S.A. 100 Count Case. It includes up to 100 pieces made with natural ingredients. There are no preservatives used in the manufacturing process, which is completed entirely in the United States. These ears are processed in a USDA facility for the highest level of quality and care. With this REDBARN Natural Pig Ear Dog Chew, 100 Count, 3 Pack, you get 300 pig ears for your dog. REDBARN does not use preservatives or artificial coloring, so these treats are healthy. Plus, they are good for strengthening your dog’s teeth. Since you get multiple packs, you only have to open what you need. That way, the others will stay fresh longer. REDBARN also uses a smoking process that locks in the flavor, making them a favorite among dogs. Natural flavors and cooking process. 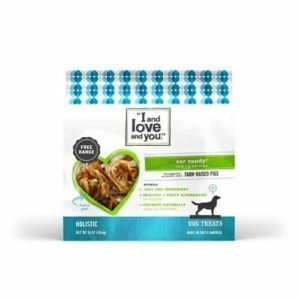 If you are looking for a small treat for your dog, check out these “I and love and you” All Natural Chews. They are 100% pork strips that make a great add-on to your dog’s meals. They come in a 16oz container so that one box lasts a long time. They are a good option for training dogs as well since a dog can eat multiple chews without getting an upset stomach. You can get this pack of Pig Ears for Dogs so that your dog has something fun to chew on. They are made with all natural ingredients so that they are a healthy snack alternative for your dog. The pack comes with ten pieces, which can last you a while. These pig ears are processed in a USDA facility according to the strictest of guidelines. That way, you know that each piece is made with high standards in mind. These Punk Hollow Humongous Roasted Pig Ears for Dogs are made with all natural ingredients. No chemicals or additives are used in the making of these ears so your dog won’t ingest things that will make him or her sick over time. Punk Hollow uses a USDA facility to process the ears so that they will be made according to healthy guidelines. There are 25 ears in this pack making it an investment in supplies that should last several months for most dogs. Your dog will enjoy Smokehouse Natural 100ct Pig Ears (USA). They are smoked for a firm but moist finish that dogs love. Smokehouse is focused on making sure that pig ears are safe and healthy for your dog, which is why it doesn’t use artificial ingredients in the cooking process. Smokehouse also rigorously tests for quality in its production process. That way, every piece that you get in this 100 piece set provides the same level of enjoyment and quality for your dog. Puppies like dog treats too, and they will enjoy these 123 Treats – Large Pig Ears Dog Chews. They are made to help your puppy stay healthy and give them a better start in life. These treats are FDA and USDA approved since they only use natural ingredients. Each ear is baked to bring out its flavor without using artificial ingredients or smoking. They are cooked to the right amount of chewy without being difficult to eat. They help clean and strengthen your puppies teeth so that they last into their later years. For larger puppies, try these Downtown Pet Supply 100% Natural, Jumbo Pig Ears. They are big enough to keep any size dog busy for a while. You can get them in packs of different sizes, but a small five-piece pack is a great option for puppies. These ears are FDA and USDA approved for their natural ingredients and overall health benefits. Downtown Pet Supply oven bakes its pig ears to bring out natural flavors, and avoid adding smokey or processed flavors that puppies may not like. If you have a smaller dog, you can give him or her these HDP Pig Ears STRIPS Dog Chews. They are loaded with nutrients and protein that will help your dog grow and stay in good shape. They come in a resealable bag so that they stay fresh until you need them. Each piece is small so that it is the right size for small dogs. Plus, these chews help improve your dog’s breath and teeth over time. HDP Pig Ears STRIPS Dog Chews are made in the U.S. The Little Grillerz Mini Pig Ears are a great option if you are looking for a small dog treat. The pack contains six treats, and each treat is small enough to be a snack or a training tool. With only six pieces in each pack, you can take it with you. The bag reseals so that you can always keep your pig ears fresh. They are made out of all natural ingredients, which is healthier for your dog and makes these pig ears taste better. This Pig Ear Pieces, 20 Pack is a good option if you are looking for a training aide for your dog. It includes 20 smaller pieces made from larger pig ears. That way, you can use them as a training incentive for good behavior without filling your dog up quickly. Each piece is made using the same all-natural ingredients used in the production of larger ears. They come in a resealable container that keeps the extra pieces fresh for months until you need them. PIG EARS DOG TREAT Bulk Packs include two large pig ears, which is enough to keep a puppy entertained for a while. These ears are smoked to bring out the flavors that dogs love and to preserve them for longer. However, the smoking process still leaves them just moist enough to keep them from being brittle. That way, your puppy won’t struggle to chew them, but won’t tear through them too quickly. Plus, the smoking process leaves just enough smokey juices for your puppy to enjoy. Larger dogs can tear through smaller pig ears quickly, which is why you should try these Baxter Boy Prime Extra Thick Whole Pig Ears. They are made with a thicker cut than regular pig ears. This makes them more durable than regular pig ears, which is great for larger and more aggressive dogs. You’ll get 15 pieces in a resealable pack. They are cooked so that they have almost no odor at all. The pack also helps contain any smells so that they are odorless. These Nature Gnaws Large Whole Pig Ears are another good thick pig ear option. They are the right size for medium or large dogs, which works well for your larger puppy. They are made only using one ingredient, and it is 100% natural. With a thicker cut, they tend to last longer. This pack comes with 100 ears included, which will be more than enough for several months worth of chewing. These Pig Ears are large so that every size dog can enjoy them. To get the best flavor, they are sourced from suppliers in the U.S. Each ear is slow cooked over hickory to give them a rich and full flavor. They are USDA-certified and are human-grade consumables, meaning that they are of the same level of quality that you would eat. This makes them healthier for your dog and can contribute to a longer lifespan. Jumbo Pig Ears for Dogs make great chew treats. Since they do not have additives or chemicals, these ears have a very limited odor. In the pack, they can last up to 24 months. You can also order multiple pack sizes that include up to 250 ears. These ears are made by a small family-run business so you can help support a local small business in the community.